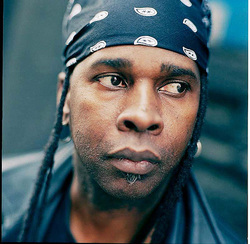 Vernon Reid was born in London, England but grew up in New York City, USA. Reid first came to prominence in the 1980s in the band of drummer Ronald Shannon Jackson. 1984's Smash & Scatteration was a duo record with guitarist Bill Frisell. In 1985, Reid co-founded the Black Rock Coalition with journalist Greg Tate and producer Konda Mason. Through the BRC, Reid hoped to counter the pigeonholing and marginalization of black musicians. Vernon Reid is probably best known for leading Living Colour. Early versions of the group formed in New York City in 1983, but the personnel solidified in 1985-86, and Vernon led the group for about another decade. Among the highlights: a double platinum-selling debut album Vivid, released in 1988; its gold-certified successor, Time's Up, released 1990; two consecutive Grammy Awards in the category of Best Hard Rock Performance; opening for the Rolling Stones' 1989 "Steel Wheels" tour; and appearing on the first Lollapalooza tour in the summer of 1991. Living Colour released Collideøscope in October of 2003 on Sanctuary Records. Since the later days with Living Colour, he has used custom Hamer guitars. Vernon's very tech savvy, and his effects and amplification are always being updated. In addition to his work with Living Colour, Reid has been engaged in a number of other projects. He released "Mistaken Identity", his first solo album in 1996 and has collaborated with the choreographers Bill T. Jones on "Still/Here" and Donald Byrd on "Jazztrain". He performed "Party 'Til The End of Time" at the Brooklyn Academy of Music (BAM) with The Roots, an end of the millennium tribute featuring the music of Prince's album "1999". He also composed and performed "Bring Your Beats" a children's program for BAM. Vernon has also produced records by Resort (a Mexican hard rock group) and two Grammy-nominated albums: "Papa" by the great African singer Salif Keita and "Memphis Blood: The Sun Studio Sessions" by James "Blood" Ulmer. Blood's most recent album, released in September of 2003, "No Escape From the Blues", was also produced by Reid. Reid also appears on "Guitar Oblique" (Knitting Factory Records) with guitarists David Torn and Elliot Sharp. Reid was also featured in the program presented by BAM and the Experience Music Project in Seattle entitled "Magic Science", which includes Medeski Martin & Wood and the Gil Evans Orchestra performing Gil Evans' arrangements of songs by Jimi Hendrix. Vernon composed the score for the film Paid In Full, directed by Charles Stone III (well known for creating the "Wasssup!" series of commercials for Budweiser as well as directing three videos for Living Colour) and released by Miramax in the fall of 2002. Reid also composed the score for the celebrated documentary "Ghosts of Attica" (directed by Brad Lichtenstein) which aired on Court TV in the fall of 2001 and has been featured at several film festivals. He composed the score for another documentary directed by Lichtenstein, "Almost Home," which aired in 2006 on the PBS series, Independent Lens. Vernon and DJ Logic, calling themselves "Yohimbe Brothers", released an album in September, 2002 called "Front End Lifter". The Yohimbe Brothers have been touring on and off since the release of the album. Reid is also the music supervisor for the film "Mr. 3000" starring Bernie Mac and directed by Charles Stone III; "Mr. 3000" is scheduled for release in the fall of 2004. Vernon's album with Masque (Leon Gruenbaum - keyboards, Hank Schroy - bass and Marlon Browden - drums), an instrumental album entitled "Known Unknown", was released in April 2004, and On April 18th, 2006 Vernon Reid and Masque released "Other True Self", both on Favored Nations records, owned by another guitarist, Steve Vai. Vernon has a prolific session output in a variety of contexts. He has played live or on record with the Roots, Eye & I, Mick Jagger, Rollins Band, Spearhead, Public Enemy, Mariah Carey, Tracey Chapman, Ronald Shannon Jackson, Don Byron, Defunkt, Santana, Bernie Worrell, MC 900 Foot Jesus, B.B. King, Madalyne Peyroux, Meridiem, Jack Bruce, Terry Bozzio, and DJ Spooky among many others. In March of 2007, Vernon played with Jamaaladeen Tacuma, and G. Calvin Weston at Tonic in NYC, and Tritone in Philadelphia, which led them to record as Free Form Funky Freqs with the title of the recording called Urban Mythology Volume 1. European Tour in November and a soon to be released CD.